Day 94: By A Nose . . . There is something about Mondays that just makes getting up and going to work a challenge. It’s not that either of us don’t look forward to work – in fact, we’re both blessed to have terrific jobs with terrific organizations in two separate cities. But, Mondays are different. Maybe it’s because we’ve started the “countdown” to Christmas or because in less than two weeks, the road to work WILL become less traveled! Regardless, Mondays are probably one of the more challenging days . . . from a work standpoint as well as a wine standpoint. We’ll get to that later. After a terrific visit from Kris and Veronique yesterday, we pretty much finished last night and turned in. It was, as we talked about yesterday, a long day filled with work on the interior of the house we’ve been renting since July of 2011. A really nice place, but in need of an Extreme Home Makeover. Unfortunately, as tenants, our makeover consists of painting. As we mentioned last night, the painting went WELL! It’s amazing what a coat of paint (with primer) can do for four walls! Anyway, not to harp on a point, but when everything gets painted, the look is “Mah-velous”! Tonight, we decided that we needed to try one of our Trader Joe’s wines. Yes, we know . . . the previous choices were less than good! NEWS FLASH – tonight’s wine isn’t much better, BUT you gotta love the name! C’mon Man, who wouldn’t stop at a display with a wine named “Nose Dive”? Seriously, have you EVER thought about buying or tasting a wine with this kind of name? No, we hadn’t either. One look at the label and let’s face it – you aren’t going to buy it. You might pick the bottle up and look at the label, but the chances of you ACTUALLY buying it? Slim to NONE! Well, we bit at the bait – a $6.99 price tag. We thought–NO! Too good to be true? Such a fun label and from an interesting winery . . .DNA Cellars. Hmmmm, maybe we should just have said, NO! But, if you’ve been following us for any length of time, you’ve probably already gotten the impression that we don’t back down from challenges. Nosedive is a CHALLENGE! 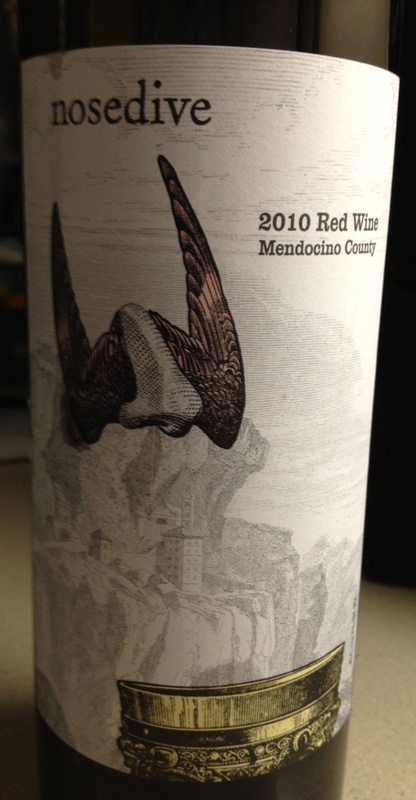 Because it’s a blend of Zinfandel AND Syrah, we’re immediately interested; however, this 2009 Nosedive is YOUNG, YOUNG, YOUNG. No matter how you slice it–not making it. Too tart. No fruit. No finish. No fun! Seriously, why would a store with the reputation of Trader Joe’s offer such LOUSY wine for sale? We’re guessing that because they’re “Trader Joe’s” that everything they sell is “haute couture” – guess what? NOT!!!!!!!!!!!!!!!!!!!! There are some awesome wines for the same or LESS on the market…one of our favorites to this day is from Australia, a 2007 Jacob’s Creek Reserve for about the same (maybe a little more) than this wine and you’ll get REAL fruit, REAL finish and a good value for your money . . . and after all, isn’t that a big part of trying new wines? All of us are looking for that great wine at a great price, and tonight, we’ve spared you the agony of trying yet another PRETENDER! When we started this blog back in September, we promised to bring you 365 wines in 365 days. We NEVER promised you that they’d all be good (or a rose garden), so part of our learning curve is YOUR learning curve. Thanks for reading and remember that, as you enjoy your favorite wine, please enjoy it responsibly and remember to recycle whenever possible. Categories: Uncategorized | Tags: DNA Cellars, Nose Dive Wine, red wine, Trader Joe's | Permalink.